What? I'm writing this post to clear up any confusion from the last two posts. Here, I said best to not be thinking buy, because everything is still below all pivots; and then more recently, pointed to all the YS levels on the turn. I'll admit this sounds contradictory. First point: if you are going to try to catch a turn, a day where you see multiple main indexes testing and holding, or breaking and recovering, yearly levels is one of the best ways to try. That said, although quite tempting to catch the bounce if you have money on the sidelines (hence the term, speculative buy), I think there is a better way of using pivots and that is to stay with the larger trend. Here are a few nifty chart examples to drive home this point. 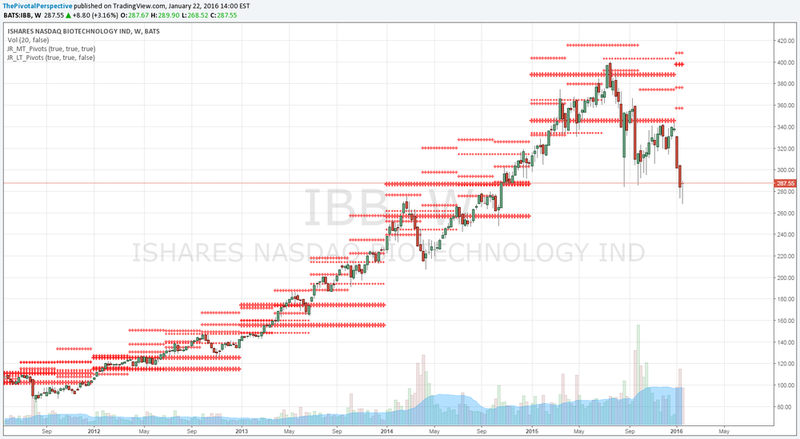 The first one below is a weekly chart of IBB showing only the yearly, half-year and quarterly pivots. Pivots always in orange on my charts. As you can see, it was above all pivots the vast majority of the time from 2012 all the way to mid 2015. This was one of the best trends in the market. In fact, focusing on biotechs above the other USA sectors would have led to spectacular out-performance. But all that changed in 2015 second half when we finally saw not one but 2 weekly bars of decent rejections of the Q3P then a huge break of the 2HP. This was a massive change in the market. The prior 3 years, any touches of the 2HP were perfect buys, if you even saw the level. Often enough the pullbacks were to the QPs, and I'm not showing the MPs here. So using this basic identifier - above or below pivots - kept you on the right side of the trend. When the asset is above all pivots, focus should be on locking in some gains when it reaches the R levels, then buying back on pivot support. Or simply holding until a real trend change which was pretty clear in mid 2015. Now let's flip it around and put only the R (resistance) levels in red. If you thought biotechs were overvalued and you were trying to short, you would have had 1) daily migraines and 2) missed one of the best uptrends in the market. Sure, you might have caught a few of the pullbacks in September 2012, May 2013, early 2014, then again in 2015. But a lot of false starts, scratches and stop outs too; and the best possible short setups would have paled to the possibility of gains. That is, until we started seeing IBB below pivots in 2015. So here is another one with gold. If you focused on the short or at least avoiding GLD below pivots, then it was very easy to stay out of this asset in 2013 and most of 2014-2015 as well. But if you were a gold bug, trying to buy the downtrend on S (support) levels in green, then you have the same situation of trying to short IBB. Here and there you catch something, but the stops and headache factor, not to mention missed chance on shorts, far outweigh any possible gains of buying and catching the short-lived bounces. Now let's turn to the more familiar SPY. It had quite a run of above most pivots most of the time from 2012 to mid 2015, but then that changed. No one really knows if this is a 2011 style pullback or 2008 meltdown, or something in between. The point is buying S levels looks great when it is also above most pivots; then looks horrible when it is below. In 2008 if trying to buy SPY, then you are buying 1/14 week at YS1 maybe, then definitely 1/21 week at YS2, again 3/17. Now all those could have had some gain. But if you started to think that buying the Supports was the way to go, then you were also buying in August and September right before the meltdown. After a huge drop you finally get a winner in 2009 but you know what? Pivots started partially buying in April 2009 (above Q2P) after being completely out of the market or short from mid June 2008. I'd rather forego the chance of bounce gains against the trend, and focus on making money with the trend, instead of getting caught in the counter-trend game. You just don't know when you are trying to fight 2 years of IBB rally, or buy before a crash. I will change my tune if QQQ recovers its YP next week, ie add back. But I'll use that area as a stop and then look for follow through above the NDX YP.